Eid ul Adha is a holiday where Muslims celebrate the Prophet Abraham’s (as) complete obedience to God by his readiness to sacrifice his most beloved: his own son Ishmael (as). Once God saw his intent, God replaced Ishmael with a ram, so Muslims celebrate this event by sacrificing an animal and distributing the meat to those who are needy and close of kin. Muslims celebrate two Eids. The first is to celebrate the end of Ramadan (the month where Muslims fast) and this Eid as I have described above. Both Eids are filled with lots of sweets. One of my favorite sweets is baklava which always looked intimidating as a dessert but is quite easy to make. Toss chopped nuts (I chop mine using a food processor. I used walnuts.) with cinnamon and set aside. 3) Unfold phyllo dough carefully. Looking at the pan you use, cut dough to size and set aside with a damp towel on top so dough doesn’t dry out. If the sheets are not perfect, or get a little torn, don’t worry. It will still come out nicely. 4) Start with one sheet of the dough and lay it on bottom of the pan. Stroke melted butter on top with pastry brush. 5) Repeat until you have done 6-8 layers. 6) Sprinkle chopped nuts on top of this last layer. 7) Add sheet then add nuts until you finish using all of the nuts. 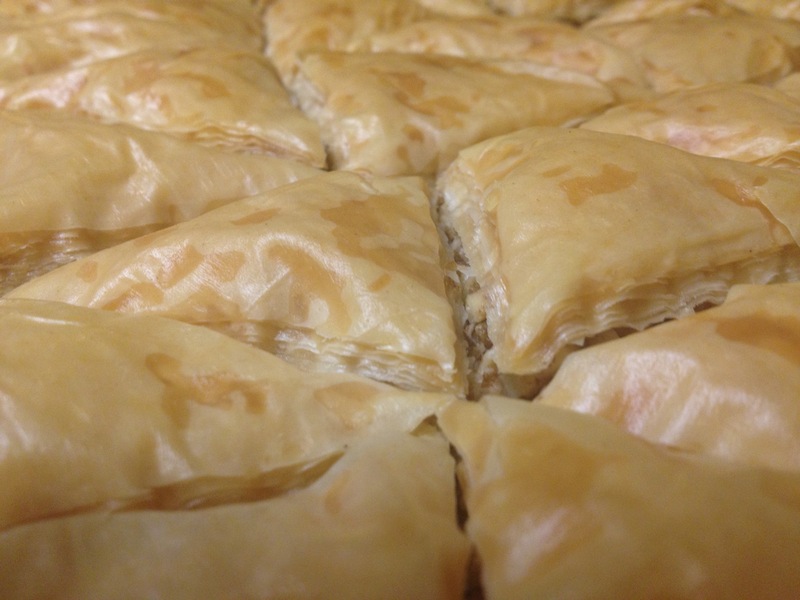 Make sure you brush butter on lightly each layer otherwise the baklava can get soggy. 8) Finish with 6-8 plain sheets with no nuts with just brushed on butter as a top layer. 9) Cut halfway through in diamond shapes and bake 30 minutes or until golden. 10) While that is baking, combine water and sugar in a saucepan with lemon juice. Boil mixture and let it simmer 20 minutes. I recommend cooling sauce in fridge. 11) Take baklava out of oven and then spoon sauce immediately over it and serve.